Desert or semi-desert covers a good deal of South Africa as you travel inland from the south. The vegetation becomes sparser, settlements fewer and temperatures climb higher. In these places you will spot ostrich, various deer and the occasional blue crane, South Africa’s national bird. Windmills stand at intervals, pumping what water they are able to from deep lying terrain to sustain crops and supply remote farms. Above all, the desert areas are stunningly beautiful and varied. 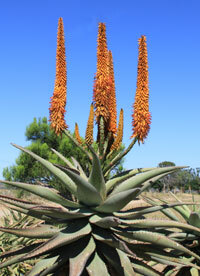 It is in this dry terrain that orange flowering aloes flourish, the same aloes that are known for their healing properties. The tough spiky agave is well established and sometimes cultivated to create impenetrable barriers. Prickly pear provides its fruit for people to pick and sell by the roadside. Travelling through the semi-desert or scrub one gets the impression of miles of wilderness, of the harsh environment, a place where few people have struggled to eke out a living. The same deserts become a paradise of flowers following spring rains, dry river beds flow with precious water and wildlife rejoices. The soil and rocks can take on strong red or ochre hues which contribute to great photographs. One of the best loved semi-desert regions is the Karoo. The Little Karoo lies in the south – the land of ostrich farming bounded by the Swartberg and Outeniqua Mountains, the Great Karoo to the north. Stay in one of the desert towns for a unique experience and warm hospitality. We recommend a visit to Graaff-Reinet, sometimes referred to as the ‘Jewel of the Karoo’, set in the horseshoe curve of the Sundays River. This is a Dutch colonial town that time forget, full of classic 18th century residences in smart streets. It is the fourth oldest town in South Africa and home to the largest number of historical monuments. That sense of history pervades the town and the craftsmanship and skill of the various trades can be seen if you walk around the town. Dutch gables are common throughout the region. There is intricate wrought iron latticework decorating some houses, in the style of doorways and chimneys.